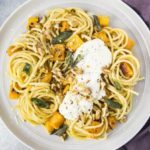 Silky bucatini pasta tossed with caramelized cubes of butternut squash and a rich, nutty brown butter sauce; topped with creamy ricotta, crunchy walnuts and crisp fried sage leaves. This pasta is easy, comforting and ultimately delicious! Bring a large pot of water to a boil. Generously salt the water and add the pasta. Cook until al dente, according to the package instructions. Drain, reserving 1 cup of the cooking water. Meanwhile: In a large skillet melt 2 tablespoons of the butter over medium-high heat. Add the squash, ginger, nutmeg, cumin, cayenne and season with salt and pepper. Cook, stirring occasionally at first and then more often as the squash browns, until the squash is browned and tender, about 15 minutes. Transfer the squash to a clean plate and set aside. In the same skillet, melt the remaining 6 tablespoons of butter over medium heat. Add the smashed garlic and cook, swirling pan until butter turns caramel brown, about 2-3 minutes. Remove garlic and discard. Add sage leaves and fry until crispy, about 15 seconds. Use a slotted spoon and transfer the sage leaves to paper towels to drain. Add the bucatini, squash and ¼ cup of the reserved cooking liquid. Toss to coat. Add more cooking liquid if pasta is dry. Taste and adjust for seasoning. Serve: Divide the pasta between serving plates. Top with a dollop of ricotta, walnuts, crispy sage leaves and parmesan (if using). Enjoy. 1. Butternut Squash Hack: To easily peel butternut squash, use a fork to pierce shallow holes all around the squash and then microwave it for 45 seconds to 2 minutes. Let cool and then proceed to peel it. Microwaving the squash softens the skin and makes it’s a cinch to peel! 2. When boiling the bucatini, make sure your water is generously salted. We are talking, as salty as the ocean. Cook the bucatini until AL DENTE and make sure you reserve 1 cup of the cooking water. You probably won't use the entire cup of reserved liquid in the sauce, but it is better to err on the safe side. 3. When adding the reserved cooking liquid to the pan, start with ¼ of a cup. If the pasta is still too dry for your taste, add more liquid a few splashes at a time.